The Pederson Little Drea LD22 and LD59VS (vintage spec) are single cut away guitars. They are identical in shape with the LD59 modeled after the ‘vintage spec’ of the ’59 Les Paul. To get their ‘maximum sustain and big open sound’ we use Select Mahogany back and sides on this model (other woods options available). 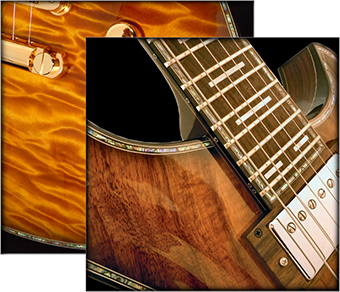 Mahogany is the desired choice for this type of guitar to play across a wide range of styles. 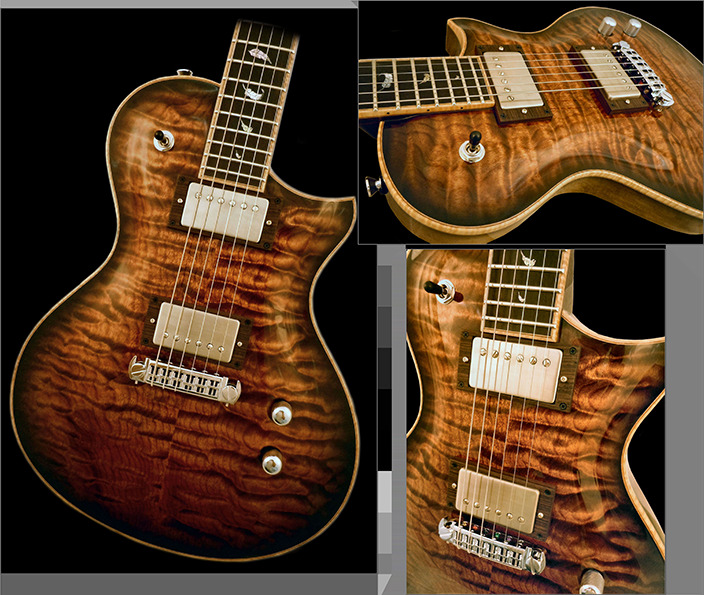 The classic combination of the maple top adds just the right blend of highs back into the mix. Standard is the mahogany neck and rosewood fingerboard. 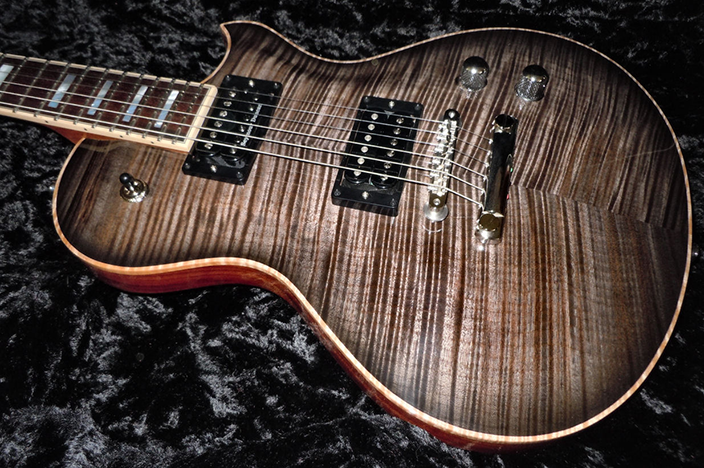 A rosewood fingerboard adds a touch of warmth back into the tonal mix – ebony is another great option. The LD22 and 59 are big, active and responsive in their output. The Little Drea is designed to allow maximum tonality, sustain and resonance during every playing experience. 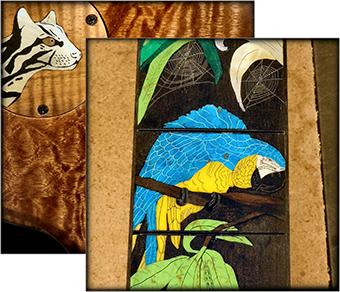 See the LD Inlay Gallery and order your custom LD22 electric guitar today. The reasons people are interested in my guitars are the high level of originality, innovation and customization that can be done over a wide range of styles — while maintaining a high level of quality and tone in these instruments. Below are a few things to consider adding to your guitar to truly make it a “one in a million” piece of history — an heirloom quality guitar. 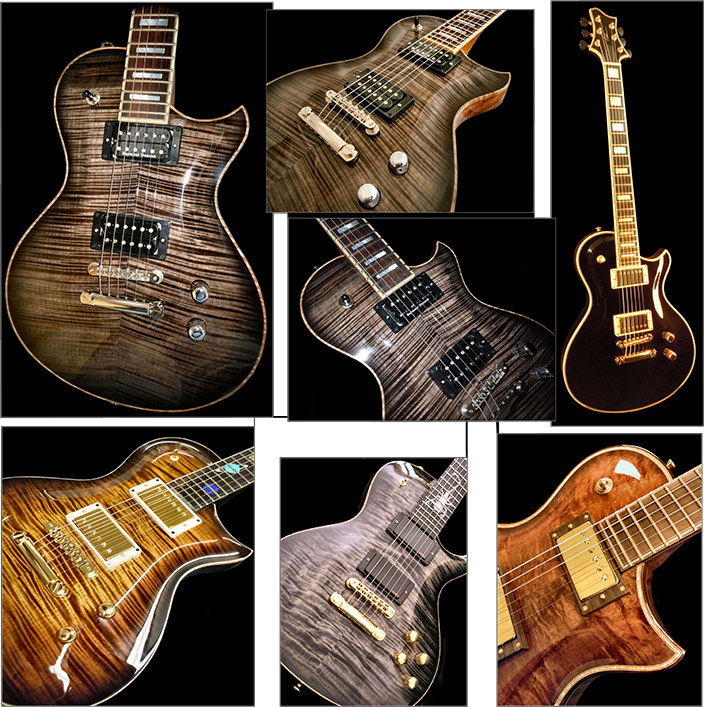 It’s this rarity that draws people to choose options like these for their treasure guitars. I’d consider some of these to be signatures of my guitars and significant to landing the guitar I build for you in the heirloom category. I feel these are reasons why you’re here. 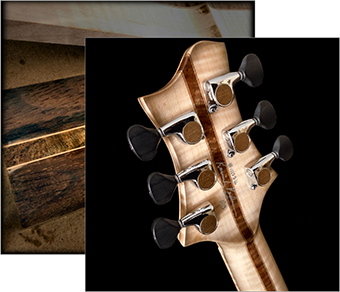 This is the ultimate way to upgrade your Pederson Custom Guitar. 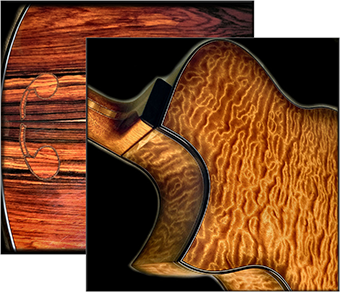 Some of the finest examples of nature’s greatest woods can be built into your custom guitar. Your dream concepts of inlay can become a reality. I do all the inlay that you see on this site. I do it by hand because some things a machine just can’t do what hand crafted can do. 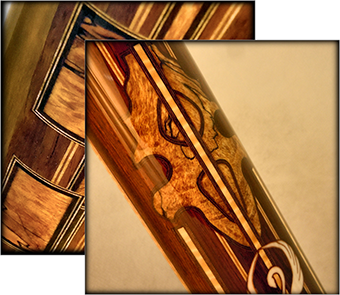 Inlay is a great way to customize your Pederson Custom Guitar. I will hand apply your chosen wood purflings and abalone bindings. This option should not be overlooked to highlight the figured and exotic woods you’ve chosen in wood upgrades. The sheer beauty of this option is reason enough to upgrade. We also gain stability and stiffness when laminating the neck shaft woods. I choose seasoned wood for your upgrades. This is definitely a signature feature on my guitars. I’ve seen some simpler things done before, such as rectangles or simple lines. However, I feel I’ve pushed the envelope on this feature. In person, these are impressive to see. Set yourself apart with this rarity! I believe it’s why you’re here.